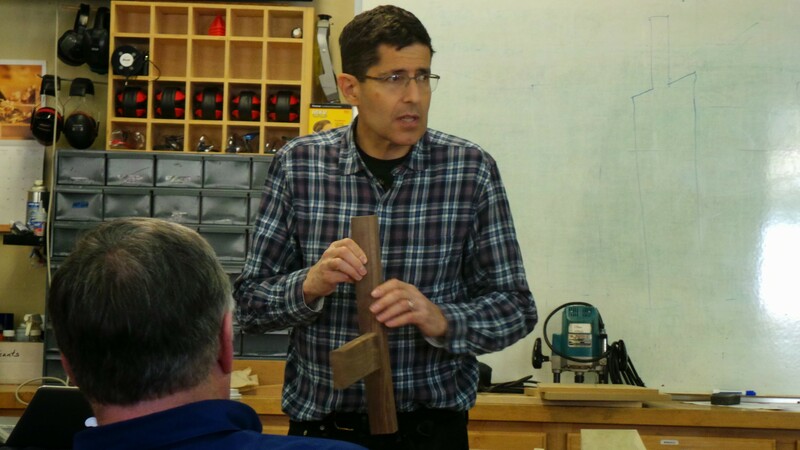 The weekend before last I headed down to Highland Woodworking and attended Jeff Miller’s Designing and Building Chairs class. 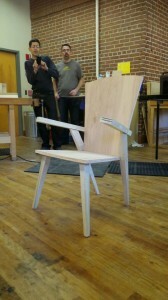 It was a two day class covering Jeff’s three pillars of chair making: Comfort, Structure & Appearance. For a successful chair, you have to balance all three. In the class we discussed what makes up comfort, structure and appearance. There are some common factors to comfort, but it is best determined by experimenting with prototypes and mockups. Structure is determined by sound joinery. While this can seem complicated (and sometimes is), it is always made simpler by breaking down the joints and simplifying the processes by methods Jeff demonstrated. The final pillar of appearance is the most subjective and therefor the hardest. Jeff described how he often starts with information on comfort and then works with a full scale drawing or model as he works out what he finds to be a nice appearance. A sketch of one of Jeff’s rockers. On the foundation of these pillars, the afternoon of day one and the morning of day two were spent reviewing specifics and methods. Among the specifics we discussed were methods for cutting and shaping, various jigs Jeff uses to provide flat reference surfaces on narrow & curved parts and multiple ways to create each necessary joint. The afternoon of day two was spent as a group activity putting all that we had learned into practice. 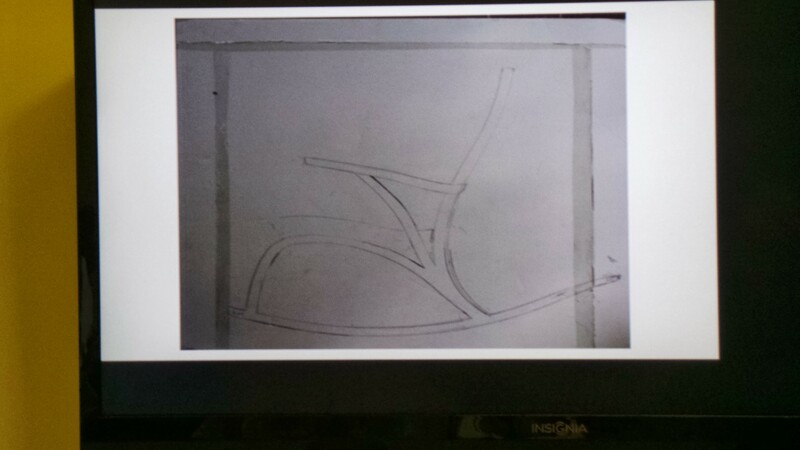 The class worked together to design a chair from initial sketches to a prototype we could actually sit in. 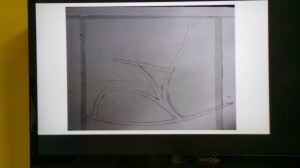 While there would still be much work left to make an actual chair, it demonstrate how the lessons we had learned worked in practice and showed how achievable an actual chair was. Throughout the entire weekend Jeff was a wonderful teacher and a fun woodworker to hang out with. He was always approachable, answering everyone’s questions and providing design comments to all who showed him their work. He was even nice enough to join a few of us for lunch and dinner over the weekend. 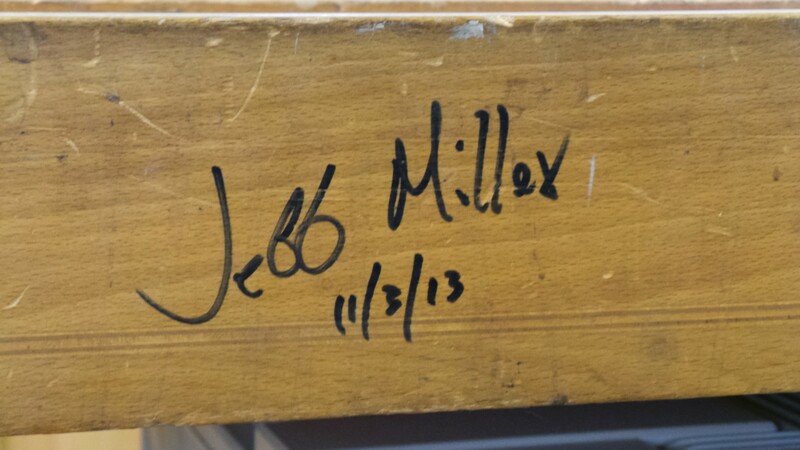 After reading Chairmaking & Design, I was excited to sign up for Designing and Building Chairs. The class and instructor lived up to all I had hoped for and made the trip from New York well worth it. I’ll certainly travel to see Jeff teach again and I’d recommend anyone interested in learning to make chairs does the same. CLICK HERE to see more photos from the class on the Highland Woodworking Facebook Page . 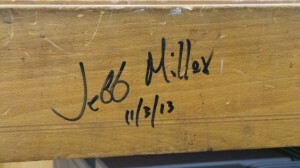 Jeff’s signature on the instructor’s bench at Highland. Dyami Plotke is a Woodworker at home, blogger at The Penultimate Woodshop, and the Long Island Administrator and Podcaster for The Modern Woodworkers Association.